The temps dipped to 32 degrees F last night here in northern Minnesota. I did not cover or carry in plants. I get stubborn in June. I didn't plant too early so "give me a break here". It should be safe to plant. Luckily my plants fared well. Do you collect vintage garden hand tools? I do. I have them in my "Eat Raisin" crate with a peace lily and my rusty iron lady. It's such a fun crate! And then there's this bird cage I bought and filled with faux succulents. The bird cage came in three sizes at the drug store gift department. This one cost $18.95. The faux succulents cost about $18 too. This is my life now "Eat - Sleep - Garden"! Oh and work! Bummer. Darn it. I forgot to eat my raisins this week! I have just started collecting vintage gardening tools and I think I'm behind the times, because they have suddenly become expensive around here. Love your vignette and love that rusty lady. That is a fun crate! I haven't found any with such cool sayings on them. I just find the cheese boxes. Love that cage with the succulents! No, one shouldn't have to worry about freezing temps in June! '-) Like you, I do have vintage garden tools. I keep them on the potting bench, but may copy your idea and bring them in for a vignette on the sun porch. Love the raisin crate. Really cute! 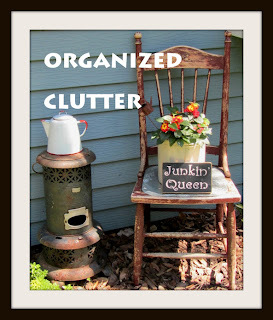 I love your crate, Carlene, and you've created a wonderful vignette with your tools and iron lady. Love your vignette with the vintage garden tools! I only have one, but I'll keep my eyes open for more! Oh how I love the vintage garden tools. I think my dad had some of those. How I wish I still had them. I use an old rake of theirs and will make some kind of garden ornament when it breaks. Got any ideas? What a cute vignette with your vintage tools. I have a few vintage tools but don't put them out. We live in Minnesota also...I think Spring has arrived now so plants should be safe. But it IS June after all. We just got home and thank goodness nothing froze while we were gone. I love your raisin crate and it's perfect for your vintage garden tools. I agree. Those darn jobs get in the way of everything! I've had the same weather here! Even a little snow today-very faint. I collect old hand garden tools too. I put them in an antique mailbox. I like the way your is displayed in the open though. Too bad for the work part! I wish you could garden every day and year round! I love that bird cage and the raisin box too! When I was a kid their was a commercial for Prince spaghetti and the end was always Wednesday is Prince Spaghetti Day! My mom probably would have been happier with Raisin Day! I feel bad for you with the weather and I agree, it is June already! What is up with the weather?? I love that raisin box! Your outdoor vignettes look great. Can't believe how real those succulents look. Isn't it amazing? You are certainly making Spring look lovely around your house. How delightful and pretty! I am so glad I saw this. I am hosting a giveaway via Arcadian Home on my blog. It would be great if you could stop by. Have a lovely day!